GGH Junior Training CANCELLED this morning at Battery Park (Sat 16th March) due to the weather. This entry was posted in Uncategorized on March 16, 2019 by greenockglenparkharriers. The national cross country championships took place in Falkirk on Saturday, with the Harriers being well represented across all of the age groups. The seniors mens and womans races are now equal in distance with both being billed as 10k. The ladies were out first on the course and were the first ones to discover that the 10k wasn’t quite as billed, with an extra 700m thrown into the tough course! The course has changed over the years, but as always the steep muddy hill leading to the forest section of the course was still there in all its glory, with runners tackling it three times during their race. Cheryl Thomas mastered this and all else that the course threw at her the best, returning home as first female harrier. Claire Monaghan paced her race well and picked off plenty of runners on the way as she finished not too far behind Cheryl. Marianne McKay was third back and was loving the hills as always, she even managed to stay on her feet this year! Lynsey Mooney wasn’t so fortunate, as she took a nasty stumble on the gravelly section of the course and sadly could not finish. Debbie McKenzie and Heather Lafferty did well at their first nationals as well. The two under 20s races interjected the seniors races, with the course getting to its ultimate chewed up state for the men to tackle it. Although, even a bit of rain during their rain was not able to really result in a muddy course this year. Paul Monaghan was first to return home for the men with a run of just over 40 minutes, with Steven Campbell not far behind. Paul Beaton and Neil Lafferty had a great battle for third spot, with Paul showing a little bit more experience on the cross country terrain to finish just ahead. It was a really good debut on the cross country for Neil, and a sign of things to come for both in the future. It was a similarly promising debut for Oliver Reilly, who ran cross country for the first time ever, and managed a very respectable finish. Danny McLaughlin had a great run to put a few of the younger guns to shame! Bragging rights were deservedly his on the bus trip back home (although some dodged the bus to avoid the pelters!). Last weeks winner Kevin Gill was brought back down to earth, sadly no trophy on offer for 631st this week, but a great run nonetheless. Alan O’Rourke said he felt the benefit of the Monday night hill sessions he has been running for the past few months, closing the gap on those ahead of him compared to previous weeks results. Can’t get a better advert than that for our regular training sessions, so get yourself along! A big shout out to the support of the seniors and juniors who cheered everyone on as they flew past the club tent. Brilliant to see so many through with plenty of bobble hats on show. The cross country season is now at a close but the racing never sleeps. A few big races coming up in the next month or two with the Balloch to Clydebank half marathon, Tom Scott 10 miler and of course the GGH Doherty Cup. Greenock parkrun celebrates it’s 250th event this Saturday and there will be pacers on the day, a great opportunity to get yourself a shiny new pb. This entry was posted in Uncategorized on February 27, 2019 by greenockglenparkharriers. It was an early start for the 15 young Greenock Glenpark Harriers on Saturday who were heading up to Falkirk to compete at the national cross country championships. The day started off with the sun beating down on Calendar Park and there was a buzz in the atmosphere with thousands of nervous and excited runners. The first race of the day was for U13 girls, and included Katie Johnson and Ava Beaton. Both girls started off strong and gradually worked their way forward, throughout the race both girls managed to maintain a consistent pace which enabled them to get a great finishing position with Ava Beaton coming 18th and Katie Johnson 42nd. 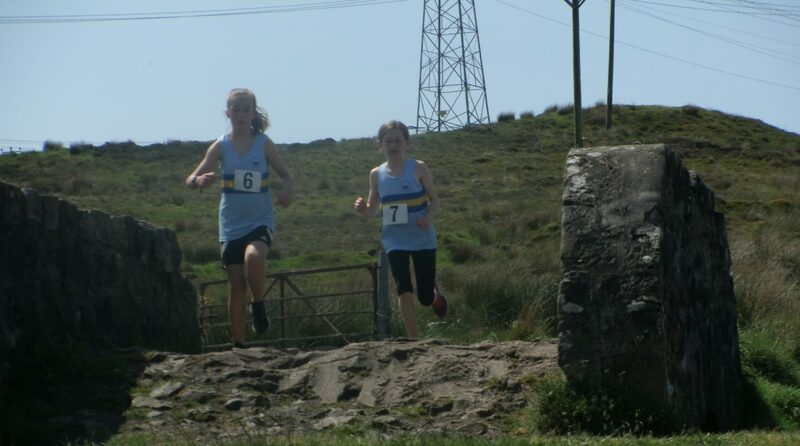 The next race of the day involved the u13 boys Ben Campbell and David Docherty. Unlike the girls the boys were pushed to the back of the pack during the race but managed to gradually pick up the pace and earn a place much further up with Ben earning 20th place and David securing 126th from a field of almost 200. One of the strongest team efforts of the day came from the U15 girls Abbie Tosh, Emma Aitken, Ruby McGill, Olivia Trainer and Francesca McKay who managed to come 9th overall. The leader for the GGH girls was Ruby who started off the race looking very comfortable, whilst Abbie and Emma kept each other company throughout the race up in till the end where Abbie just got ahead of Emma by a couple of seconds. Another strong performance was shown by Olivia Trainer and Francesca McKay, who managed to keep a consistent pace which participated in the team’s overall finishing position. U15 boys Shaun and Alex Wiseman were in the second to last race of the day and considering it was first time competing in a national event, it was a great effort from the brothers. Shaun showed a great pace throughout the race but gradually increased it to be able to get a better time, not too far behind him was team mate Jude Dolan who kept fighting until the very end of the race. Alex worked extremely hard on his national debut by pushing on with determination throughout the 4km and ending off with a sprint finish. The last race of the day was the U17 men’s 6km. For this race all three runners, Harry McGill, Ewan Ferguson and Alan Mollins put in a fantastic display. Harry quickly progressed into the leading pack (despite having a slip at the starting line) and managed to maintain this position throughout the race which enabled him to come home in 6th place. Another who impressed was Alan who had managed to gain himself an impressive time and placing, despite only have coming back from a long term injury a couple of months ago. Ewan Ferguson also ran well and though he was injured throughout the race, he managed to keep going and fight through the pain which overall enabled him to come 79th place. This entry was posted in Uncategorized on February 26, 2019 by greenockglenparkharriers.